No wonder many couples who choose to Dalat as a honeymoon spot. The only cool the tube in Vietnam complete with French-style villas. Therefore, the city is nicknamed "The Honeymoon Mecca" or a honeymoon paradise. In the book "1,000 Places To See Before You Die", a travel book written by Patricia Schultz, Dalat is described as a small town in the highlands, about 300 km from Ho Chi Minh City is popular with French-style villas. 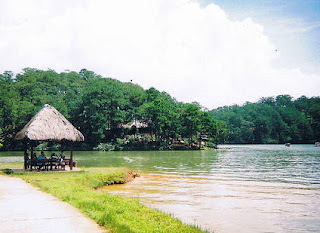 This is because, once the area became a resort in the French colonial era. Traces of the French more visible when you come to the train station of Da Lat Railway Station. Built with art deco style by French architect Moncet & Reveron. 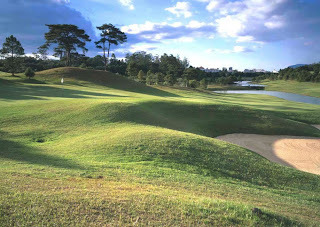 One more buildings that are very popular and iconic city of Dalat is the "Dalat Palace Luxury Hotel & Golf Club". The hotel was built around 1920 by French colonial decor, with a page about 5 acres of beautifully landscaped. The number of magnificent buildings French architecture makes this area look very pretty. The atmosphere is beautiful, cool and beautiful, making this city earned the nickname "The Honeymoon Mecca" or a honeymoon paradise for the people of Vietnam. Cool? Yes, because of Dalat is the only area in Vietnam is cool all year round like a valve spring. So, no wonder that many couples who choose this city as a destination for honeymooners. Coolness of Dalat city air can make sense of upset from too expensive to pay the taxi was gone instantly. Serving the city lights with a colorful glow like the Eiffel tower looks very pretty. Tower "Eiffel" was found to be in addition to the main post office, the Buu Dien Tinh Lam Dong, or known as Little Paris. The city lights reflected off the picturesque Xuan Huong Lake is stretched across the city. In the evening, a visit to Dalat Night Market could be the right choice. As the night market in general, all kinds of goods sold here, including knick-knacks for a souvenir. Near the Night Market, we can also dine at the cafes are arranged neatly on the side of the road to the hill. Or, you can also relax while enjoying a baguette bread (typical French bread), roasted corn, meatballs, sausage grilled, or boiled eggs sold by merchants who sell their wares at one side of the lake. In addition to a variety of food that attracted the most attention is the existence of places tandem bicycle (a bicycle with two seats) around the lake and near the night market. Pedaling alone with your partner, enjoy the cool air of the romantic little town is really an experience I will never forget. However, for the citizens of Vietnam, Dalat is one of the favorite tourist destinations. Just need to fly about 50 minutes away from Ho Chi Minh City. Other than through the air, can be even cheaper if taken by road and we've been able to enjoy the romance of this little town. 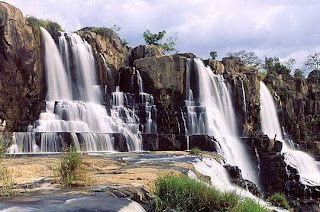 For tourism purposes, Dalat has many waterfalls are located not far from the city center and often made attractions, such as Cam Ly waterfall, waterfall Datanla, and Prenn waterfall. Although these places look simple, very clean and convenient location. There is nothing littering the place. Dalat hygiene can be a very good example for tourist attractions in the country. If you want to linger in Dalat, strawberry plantations, where handicrafts, Embroidery Museum, and the center of Dalat artist could be an alternative that is not less interesting. A trip to the Summer Palace with a beautiful garden and other popular tourist attractions, such as the Valley of Love (Thung Lung Tinh Yeu) can also be an option. Valley of Love park contains statues that symbolize love and flower gardens are arranged neatly. As the name implies, of course the main dish in the Valley of Love is a beautiful valley with a lake that is wide enough. If you want to navigate the lake in the Valley of Love, you can ride the boat. Indeed, a perfect honeymoon in Dalat, a small town which serves a stretch of scenery and a very romantic atmosphere.